They call it "the land of the dry riverbed," but 40,000 years ago Gobustan, in eastern Azerbaijan, was rich, green and densely wooded. In the period after the last Ice Age, cave-dwelling people hunted deer and goats, harvested food from the savannah grasslands and sailed in the Caspian Sea. At this early seat of human civilization, travelers from East and West met and settled in a series of limestone caves and, for generation after generation -- right up until the 20th century -- left their marks on the shelter walls. 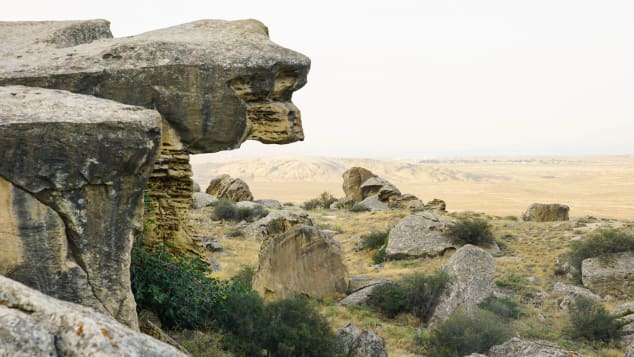 Today, these rocky enclaves -- around 20 in the total, spread across three hills -- are at the heart of Gobustan State Reserve, a unique outdoors museum across 537 hectares, accompanied by a state-of-the-art visitor center. On this limestone plateau in the semi-desert, there are more than 6,000 rock carvings, known as petroglyphs, with more being discovered all the time. 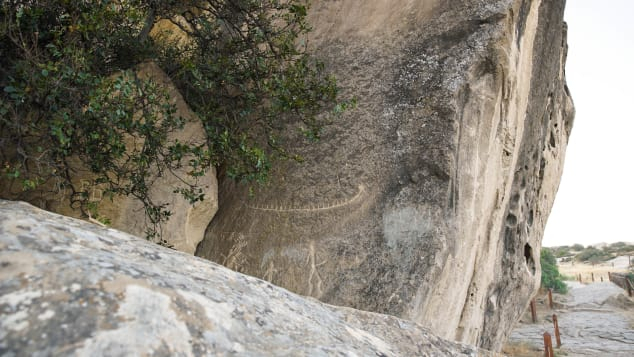 "Petroglyphs are the most ancient art of human civilization," Rehman Abdullayev, the reserve's scientific secretary tells. "There was music connected with rock art; there was dance, art, paintings also. But these days we have only the petroglyphs on the walls." For thousands of years these shelters were both living place and religious sanctuary. Rituals and magic ceremonies took place here, as well of worship of ancestors and of the mountains. The carvings show warriors and tattooed women; oxen, deer and goats; scenes of fishing and scenes of sacrifice. The landscape has changed beyond recognition, the original flora and fauna gone with the climate change -- but while we can no longer see what our ancestors saw, we can hear what they heard. Gobustan State Reserve: Gobustan State Reserve, in eastern Azerbaijan, is home to more than 6,000 ancient rock carvings, known as petroglyphs. The Gaval Dash, which stands at the entrance to the park, is one of four "singing stones" found in the reserve. When this hefty two-meter-long stone is struck with smaller rocks, it makes a hollow, ringing sound -- in Azerbaijani, Gaval Dash means "tambourine stone." This unusual resonance is due to the presence of microscopic holes inside the rock, thought to be a consequence of the dry climate and the effect of natural gas in the region. Visitors today can still play this early musical instrument, beating out rhythms which echo those made eons before. "Each of [the stones] has traces" showing "they've been used for a long time," explains Abdullayev, pointing out the bowl-like hollow that has eroded the center of the rock. The rock is free-standing on top of smaller stones, to better enhance the sound. 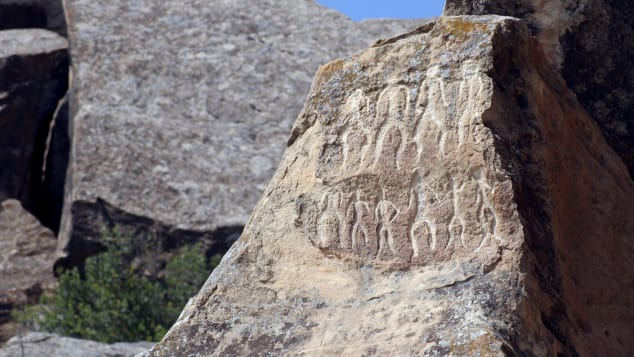 One of Gobustan's most famous petroglyphs is thought to depict dancers taking part in Azerbaijan's traditional Yalli dance, where participants are arranged in a circle or chain and dance holding hands or shoulders. The Gaval Dash may have been used to make ritual sounds for these Yalli dancers. Shelter: Here on this limestone plateau, collapsing rock formed a a series of around 20 caves which were used for thousands of years as human shelters. Petroglyphs showing boats and fish point to the fact that, at one time, the Caspian Sea was likely to be a higher level, making the three hills almost islands. In the Upper Paleolithic, the Caspian Sea was connected with the Black Sea so there were greater possibilities for people to make long trips from other parts of Europe. Some of the petroglyphs are of boats holding as many as 40 people. The most ancient carvings, of the High Pleistocene and Early Holocene period -- an era covering more than two million years, show oxen and wild horses, and collective hunting of large animals. When climate change took place at the end of the Pleistocene period, about 11,000 years ago, the hunting targets changed and the carvings began to show wild boars, bird and dear. In the Neolithic era, covering 4000 to 2500 BCE, scenes of dancing, sacrifice and ritual magic began to emerge. In the Bronze it was domesticated animals, deer pens, and carriages pulling riders. In the Middle Ages, from the 5th to 15th centuries, this changed to Islamic inscriptions, tribal signs, and new, elaborate scenes of horse-hunting. Around 500 new carvings have been discovered in recent years, as well as a Bronze Age game dubbed "58 Holes," found etched into rock. The area hasn't been fully explored yet, so there will surely be more mysteries to uncover.